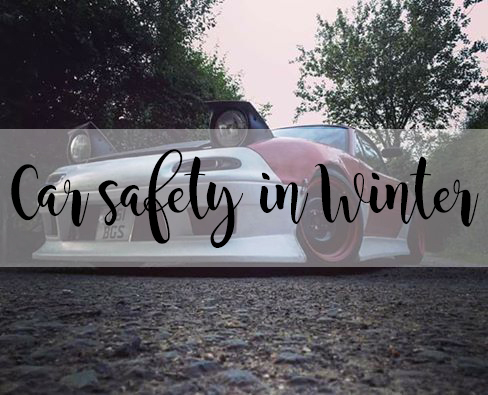 Although Blogmas is filled with lots of happiness and very exciting posts, we also need to talk about the serious bits of life through Winter, starting with car safety! As a car driver myself, I am very very nervous about driving on the roads this Winter. I was a learner last Winter, however we didn't have any ice, or snow where I live so there was no issues, however I have a little bit of a feeling we're going to get either both or at least one of the two this year. Therefore, driving on the snow or ice is going to be the most scariest part of driving ever! Probably more scary than a driving test itself. Unfortunately the cold and icy or even damp roads can affect the performance of our tyres in a dramatic way, to a certain extent where there are so many more accidents on the roads too. I'm not sure if you have, but I know I see so many more accidents in Hertfordshire/Essex throughout the Winter compared to how many I see in the Summer (and I live in a tiny village too). I found some incredible information from TyreSafe and found out in Winter you have 9metres less on your stopping distance in both icy and snowy roads when travelling at 20/30mph. That's a fair amount of distance to be honest compared to stopping in Summer! Therefore, in times like now you need to have more awareness of what's happening on the roads around you and how long you have to break when someone slams their breaks on in front of you (this happens a lot too). If you didn't know, the temperature of a tyre makes such a different to the tyre's ability to perform. If the temperature on your tyres drops below 7 degrees, then your tyre hardens and you have less grip. This is why so many people swerve throughout Winter because when they're breaking and it's absolutely freezing, the car tyres cannot grip onto the road to come to a stop. Another way of damaging the tyres too! I recently found out there are now specialist tyres out there just for Winter so your car can perform better throughout the colder months with ice and snow. If you're in and around the South East of England, you can visit Point S local dealers in Hertfordshire to get yourself some brand new Winter tyres! I have lived in Hertfordshire all of my life and I never knew this company was here! They have all sizes and brands there, so you do not have to worry about whether or not they won't have the tires for you, because they will! "Simply plug in your car’s registration number and we show you the car tyres which can serve you. Once you decide which ones to opt for, you just enter your postal code. This lets us locate which dealers would be closest to you and we show you a well-developed list with all the information you need. This list will display opening timings, telephone number & contact information". It's as easy as pie! Remember to keep an eye on your tyres throughout Winter and take care of them too! This post was in collaboraton with Point S, however all opinions are my own. Make sure to check their website out!